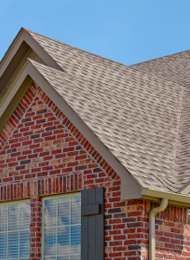 We are proud to offer a variety of services for residential roofing. We are able to repair your roof from just about any damage, and we are happy to install a new roof, or waterproof yours, when it’s come time to better protect your home against the elements. For great service and commitment to 100% customer satisfaction, call us today and schedule your free estimate! We are a company who specializes in customer service – we believe in going beyond the parameters that other competitors in the industry adhere to. Our team of roofers are uncompromising on every level of residential roofing services we deliver, and would be happy to earn your business, whether you need minor or serious roof repair, or are in the market for a new roof. Call us to see how affordable our residential roofing services are! We excel in many residential roofing services, and we will provide each and every customer with the absolute best possible job that can be achieved. Our roofers will answer all of your questions and make sure you are fully informed on any decisions you have to make when it comes to your roof repair or replacement and show you all the options. We are one of the best companies you’ll find in the region when it comes to residential roofing, having over 40 years of experience in the area. We have a reputation for excellent customer service and quality, and live up to that with each and every job we do! Shingle Roofs – we install, repair and replace asphalt shingle roofs for a timeless beautiful look for your home. We offer over a dozen colors and styles to suit your needs. Roof Replacement – no single home improvement project can have such a significant impact on your house as replacing your residential roof; trust a team who will do it right: how you want it, on time and within your budget. Roof Repair – we understand how important it can be when you need repairs on your residential roof, and we will get the problem fixed as soon as possible, and prevent them from coming back as best as possible. New Roof installation – we will make sure your new roof is perfectly installed and beautiful so that it will not only look great, but give your family and your new home additional protection from snow, wind, rain, heat, and cold. We are a leading, insured roof replacement and storm-damaged roof restoration company who provides FREE, no-obligation inspections and roofing estimates. We only work with time-tested materials such as Tamko, Gaf, and Certainteed, from one of the largest manufacturers in the United States, so that you’ll be getting the best in the business for your residential roofing, no matter what it is you need. Contact us if you are looking for help with your residential roof. We are known for being a company with a team of roofers who have the highest of integrity in our service and our work. We won’t let you down. 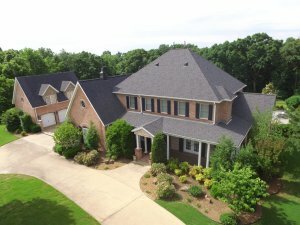 We handle repairs, replacement and installation of residential roofing in Bentonville, Springdale, Fayetteville, and all of the surrounding areas.